I love afghans! 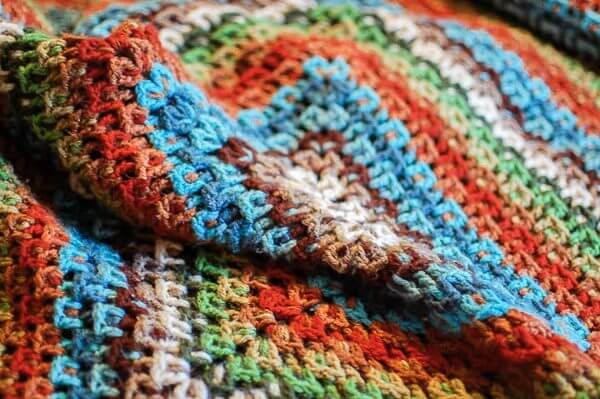 There is nothing like curling up under a soft cozy blanket, especially one that that has been lovingly made stitch by stitch. 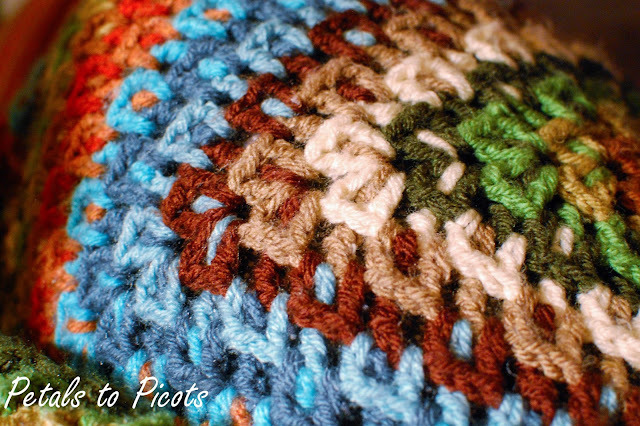 I recently worked up this afghan, which I like to call my Crochet Kaleidoscope Afghan Pattern because of all the beautiful colors. I first got the idea to make this when I saw Amy Schwab’s Fireworks Surprise Square on Ravelry. But I didn’t want just a square, I wanted a whole afghan. So, I played with the pattern to make it a rectangle shape and just kept going. It is gorgeous and has fast become a family favorite! Round 1: 1 dc in 5th ch from hook (cts as 1st V-st), ch 2, V-st in same ch, ch 1, sk next 2, V-st in next, ch 1, sk next 2, [V-st, ch 2, V-st, ch 2, V-st] in last ch; working along opposite side of chain, ch 1, sk 2, V-st in next, ch 1, sk 2, V-st in same ch as 1st st made, ch 2, join in 3rd ch of beginning ch 4, fasten off. Round 2: Join new color in next ch-2 corner, [ch 4, 1 dc (counts as V-st), ch 2, V-st] in same corner, working behind and in the middle of V-st below, dtr2dwn in same chain as next V-st below was made, *V-st in next ch-1sp, dtr2dwn in same chain as next V-st below, rep from * once more, [V-st, ch 2, V-st] in ch-2sp, dtr2dwn in same chain as next V-st below, [V-st, ch 2, V-st] in ch-2sp, dtr2dwn same chain as next V-st below, **V-st in next ch-1sp, dtr2dwn in same chain as next V-st below, rep from ** once more, [V-st, ch 2, V-st] in ch-2sp, dtr2dwn in same chain as next V-st below, join in 3rd ch of beginning ch 4, fasten off. Round 3: Join new color in next ch-2 corner, [ch 4, 1 dc (counts as V-st), ch 2, V-st] in same corner, working behind V-st below, dtr2dwn in same ch-sp as next V-st below was made, *1 dc in space before next dtr, ch 1, 1 dc in space after next dtr, dtr2dwn in same ch-sp as next V-st below was made, rep from * twice more, [V-st, ch 2, V-st] in ch-2sp, dtr2dwn in same ch-sp as next V-st below, 1 dc in space before next dtr, ch 1, 1 dc in space after next dtr, dtr2dwn in same ch-sp as next V-st below, [V-st, ch 2, V-st] dtr2dwn in same ch-sp as next V-st below was made, **1 dc in space before next dtr, ch 1, 1 dc in space after next dtr, dtr2dwn in same ch-sp as next V-st below was made, rep from ** twice more [V-st, ch 2, V-st] in ch-2sp, dtr2dwn in same ch-sp as next V-st below, 1 dc in space before next dtr, ch 1, 1 dc in space after next dtr, dtr2dwn in same ch-sp as next V-st below, join in 3rd ch of beginning ch 4, fasten off. Round 4: Join new color in next ch-2 corner, [ch 4, 1 dc (counts as V-st), ch 2, V-st] in same corner, working behind V-st below, dtr2dwn in same ch-sp as next V-st below was made, 1 dc in space before next dtr, ch 1, 1 dc in space after next dtr, *dtr2dwn in top of dtr below, 1 dc in space before next dtr, ch 1, 1 dc in space after next dtr, rep from * twice more, dtr2dwn in same ch-sp as next V-st below was made, [V-st, ch 2, V-st] in ch-2sp, dtr2dwn in same ch-sp as next V-st below, 1 dc in space before next dtr, ch 1, 1 dc in space after next dtr, dtr2dwn in top of dtr below,1 dc in space before next dtr, ch 1, 1 dc in space after next dtr, dtr2dwn in same ch-sp as next V-st below was made, [V-st, ch 2, V-st] in ch-2sp, dtr2dwn in same ch-sp as next V-st below, 1 dc in space before next dtr, ch 1, 1 dc in space after next dtr, **dtr2dwn in top of dtr below, 1 dc in space before next dtr, ch 1, 1 dc in space after next dtr, rep from ** twice more, dtr2dwn in same ch-sp as next V-st below was made, [V-st, ch 2, V-st] in ch-2sp, dtr2dwn in same ch-sp as next V-st below, 1 dc in space before next dtr, ch 1, 1 dc in space after next dtr, dtr2dwn in top of dtr below,1 dc in space before next dtr, ch 1, 1 dc in space after next dtr, dtr2dwn in same ch-sp as next V-st below was made, join in 3rd ch of beginning ch 4, fasten off. Continue working rounds as in Amy’s pattern, but be sure to increase the stitch counts on the long sides of the rectangle as you increase in size. One thing to note … as happens many times when increasing a motif pattern, as the size increased, the corners can sometimes become a little skewed. When I thought I started to see this happen, I remedied it by working [V-st, ch 1, V-st] for the corners for a few rows and then continuing as usual. 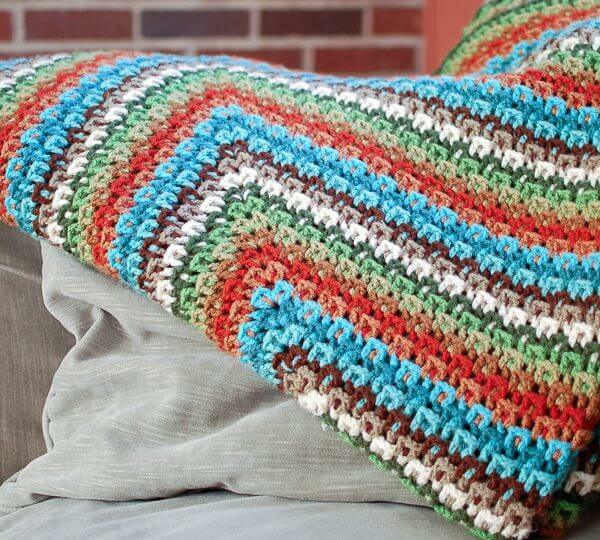 Click here for more free crochet afghan patterns. You’d mentioned a pattern we could pay for on Ravelry. I’d like to purchase that (at one time it was $4 – don’t know if it costs that now. But I REALLY want to make this pattern!!!! I’d rather purchase the pdf/pattern on Ravelry as I believe you said you referred to videos within the pattern! I see that someone else asked the same thing, but how do you go 2 rows down when it’s just the second round being done? can you do a video tutorial of this pattern, perhaps just each round? It’s hard to understand for instances what you mean exactly in round 2-woring behind and in the middle of V-st below, dtr2dwn??? Help please, I’d really like to make this!! It means double treble 2 rows down. I LOVE THIS LOOK!! IS THERE A VIDEO ON THIIS PATTERN? I DO BETTER WHEN I CAN WATCH A VIDEO.THANKS FOR SHARING WITH US. Please define your V-stitch. I am confused by your use of ch1 and ch2. Is your V-stitch this: (dc, ch2, dc) or this: (dc, ch1, dc)? Where do the ch1’s come in? why are there ch1’s and then ch2″s? I am having trouble beginning this pattern. Is there anywhere else that explains it better? Is there any sort of video? Thank you. 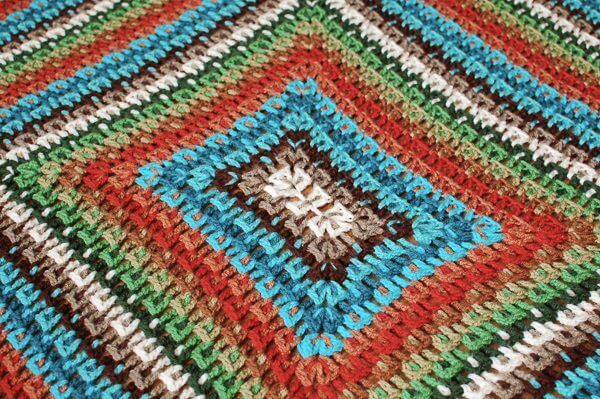 The afghan is lovely and I am wanting so much to make this pattern. I donate prayer shawls to Threads of Compassion in Indianapolis and I think this would make a lovely shawl. Once I learn this pattern correctly, I plan to elongate it. love this, one question what yarn did you use? I purchased Amy’s pattern and then with that, modified yours a bit to create a rectangle that’s 3x as long as it is wide (to create a seat cover for my husband’s office chair). It’s FABULOUS! Thank you so much for your post!!! I’m considering either doing it again (maybe this time using a larger hook) or testing my hand at a super-colorful version of your Breath of Heaven Blanket. I’ll keep you posted! Help on How-to on Row 2. Do you. Have pictures or more info? Can you send me, Please? Hi Wendy 🙂 All the abbreviations and stitch descriptions are in Amy’s original pattern. I am having the same problem as Linda. I am trying to make the afgan for a customer, who has bought all the yarn necessary. I don’t understand, how clarification of your round 2 is a “reprint” of Amy’s, since your round 1 is different the round two is different. I also have made a sample “Fireworks” square and can not come up with the transition. Clarification (diagram) of row 2 would be MUCH appreciated. The yarn and pattern have been bought, I need some assistance to complete the project. Thank you for your time and assistance. Hi Laurel 🙂 I have added more detail. Hope that helps! Hi Linda 🙂 I am sorry but I really can’t print any more than I have here because I would technically be “reprinting” Amy’s pattern. I can only print the beginning part that I did differently. The next rounds would differ only with the amount of repeats along the sides since it is a rectangle instead of a square. Hope that helps. Sorry I can’t provide more. Too bad. I really wanted to make this. Can you point me to the original pattern? I might consider buying it. Hi Stephanie 🙂 It is the Fireworks Surprise pattern on Ravelry. If you end up buying it, just follow my modifications above to make a rectangular afghan. Hope that helps! Oh darn! I guess I saw the afghan too late to get the pattern. I love it! Unfortunately, I took it down 🙁 The pattern that was the original inspiration for it ended up being put up for sale so I didn’t want to give away too much information and cause a conflict of interest. Sorry! This looks like the perfect pattern to use up all those skein ends and/or one skeins. I have a bunch of small odds and ends to use up. Thanks so much for the pattern. Yes, it definitely is a good one for that! Gorgeous! I cannot wait to make this! Very cool! I love your adaptation. Thanks so much for linking up on Hookin On Hump Day! It’s amazing!! I love the pattern it makes. Great Job! So pretty! Looks like a great way to use leftover yarn too! This is gorgeous! I may just have to try this after I get done with the afghan I’m working on. Have you tried the Never Ending Granny? Go check out the Crochet Crowd. Mikey has a wonderful tutorial on it. I am trying the 7 strand. I can’t wait to finish it. I like how these stitches look and I really like the colors you used! It’s sooooo pretty! I just wanna snuggle up in it, LOL! Very Nice, I may have to try one soon! Love your color choices too! So warm n cozy.. I would never be off the couch if I had such loveliness draped over it! Well if this isn’t just the most cozy blanket ever, then I do not know what is! I love the warmth of the colors and pattern. Nice job! Lovely, so cozy and warm colors !! That blanket is gorgeous. The colours are so beautiful. I think it is a -be happy blanket-. It makes you smile.